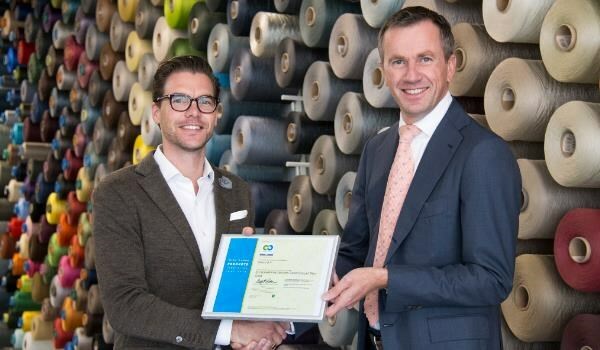 Desso has reached a major new milestone in its Cradle to Cradle (C2C) journey in becoming the first carpet tile manufacturer in the world to achieve Cradle to Cradle Gold level certification for a new carpet tile collection. The Gold certification is the culmination of seven years of hard work and effort, inspired by the goal of transitioning to the circular economy, based on Cradle to Cradle principles. The collection will be launched in all key markets in October 2015. The new ‘Gold Collection’ comes standard with an EcoBase backing, that contains upcycled re-engineered calcium carbonate (chalk) from local drinking water companies, which is 100% recyclable in Desso’s own production process. In addition, the collection contains ECONYL, a 100% regenerated nylon made from recovered waste materials including post-consumer yarn waste from DESSO’s Refinity plant. Now 93% of Desso’s commercial carpet tile range is Cradle to Cradle certified. To reach this golden milestone, Desso has had to fulfil a broad range of tough environmental and human health criteria, as defined within the Cradle to Cradle Certified Product Standard. This is a framework for innovation, which shows that ‘designing with purpose’ makes perfect business sense and at the same time, positively impacts the environment and human health. Products are certified by the independent Products Innovation Institute, based in the US. Next to this collection, 93% of Desso’s commercial carpet tile range is Cradle to Cradle certified, at either Bronze or Silver level depending on the backing type.